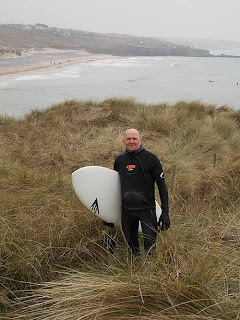 PaddleAir Ergo Testimonial from the U.K.
One of the coolest things for us at PaddleAir is to get feedback from actual users of our product and how it has helped them paddle stronger so that they can surf longer. Below is a wonderful testimonial about the Ergo from Dean who surfs the waves off Cornwall in the U.K.
Just want to say a big thanks to all at PaddleAir. I received [the] new ergo vest and its lived up to what you promised ... I've been using it [and] constantly thought you might like my feed back for what its worth, after my first few tries I don't even think about it. It's comfortable, non-restrictive, fits well but the most important thing is it works. Wasn't sure how much difference it makes but try it for one week then go back to not wearing it and you really notice the difference. Its so much easier to paddle more power [and with] much more comfort and even more enjoyment to my surf sessions. I got the vest after bad lower back problems, and two stomach operations, my back pain has also decreased so that I could surf without the vest since I've been using the ergo vest, the only down side is when surfing now I feel like I'm cheating with the increased paddle power. Its the first time I've ever contacted a company regarding a product but i wish you all the best with this product it deserves to be a success! If anyone hasn't tried one, i strongly recommend it, it will change your life swear to god !!!!! And Dean, when he sent in the photo above -- taken from Godrivey looking towards Gwithian, St. Ives Bay Cornwall -- also added the note below. Tagged in photo for you taken today not the greatest picture but hope its ok. Been using the Ergo top for over a month now and I haven't changed my mind from my initial comments. It works so well! Last two days surfed for four hours each session with no problem with my back and now back in the water it actually feels my back has improved and almost pain free! Just hope my initial comments on the Ergo top didn't make it sound like your product was only suitable for older surfers or people with back, neck or stomach, problems its great for any age. I also think it would prevent the injuries of. the lower back common to surfers of all ages. Many thanks again Dave for a great product. Thanks Dean! You can learn more about the Ergo (now available in the classic short sleeve and as a sleeveless vest) and read many more testimonials on our website.